Fashions change at a phenomenal rate. Cast an eye over a woman’s magazine (alongside my piles of bike mags I like to keep abreast of things with Closer and Glamour) and what was hot last month is now just polishing rags under the sink. And don’t think bikes are free from trends. Look at modern sportsbikes. Buy the latest, greatest 600 or 1000cc sportsbike one year and two years later it will be a has-been. Are the Japanese leaping forward with such giant steps year on year in terms of performance? Of course not, but fashion is. 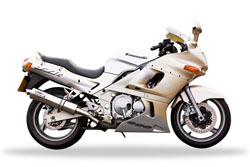 Believe it or not, the ZZR600 appears on Kawasaki’s 2008 model range. The old girl hasn’t given up the ghost quite yet and there are nine brand new ZZR600 waiting in Kawasaki dealers in the UK for an owner to walk in and hand over the £5,600 asking price. But these will be the last nine ever sold, from 2009 EU emissions laws have killed off this middleweight dinosaur. So, it’s with a slight tear in our eyes that we bid farewell to a bike that has won an army of fans since it was first introduced in, believe it or not, 1990! Yes, when Madonna was Vogueing and Saddam was marching into Kuwait, Kawasaki was entering the supersport fight with the ZZR against the likes of the CBR600, FZR600 and GSX600F, which it proceeded to blow into the weeds thanks to its monster engine. The ZZR600 is a proper Kawasaki, therefore it has a stonking motor. 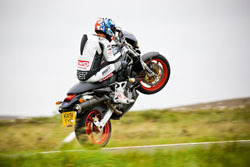 At the time the ram-air rocketed the ZZR up to speeds of over 150mph, which was unbelievable for a 600. But it was comfortable too, which was, in the end, both its downfall and its saviour. Whitham used to race against ZZR600s, which shows they did have some track credentials, but Kawasaki launched the ZZR believing the 600 market was turning towards relaxed riding rather than supersports. Unfortunately they got this wrong and five years later had to launch the ZX-6R range to compete against the sporty competition. But the ZZR lived on, attracting a more restrained rider who put comfort ahead of handling prowess. Which is exactly how the ZZR feels to ride. It’s long, low and very, very comfortable. The fairing might not look the prettiest in the world, but its screen is effective at sheltering the rider’s head from the wind while the rest of the bodywork keeps the elements at bay. And the riding position, while still having a slight nod towards the sporty, is far more touring than a modern 600. But it doesn’t stop there, the seat is comfortable, pillions aren’t perched above the rider on a plinth like they are on a modern 600, and the tail piece even includes fold-out bungee hooks. 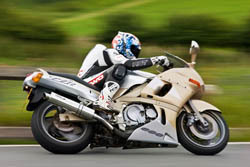 In fact the ZZR has many features that modern sports tourers fail to include. But it also has plenty of limitations. When you ride the ZZR you realise just how much the handling on modern sportsbikes has improved. The Kawasaki feels like an oil tanker compared to any half-sporty modern stuff. The back end is low, making it reluctant to turn into corners, and the whole bike feels about two feet too long. The ZZR was conceived at a time when stability was paramount over razor sharp handling, and it shows up in its ride. Yes, you can use a bit of brute force, learn to deal with the pogoing suspension and trust the tyres will stick, but if you are really that desperate to go fast buy a sportier bike, don’t force the ZZR to do something it doesn’t want to. The ZZR600 just wants to cruise in a straight line at a fast pace, which it does very well. 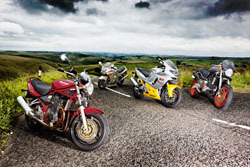 Dealers say secondhand ZZRs are popular with new riders and females due to the low seat height, which inspires confidence. If this is you then the ZZR isn’t a bad buy, or if you are looking at buying a cheap bike to eat motorway miles, run completely hassle free and use every day of the week come rain or shine the ZZR should certainly be on your list. The engine is strong, smooth, vibration free and virtually indestructible. What more could you ask for in a daily ride? A secondhand ZZR is a worthy, if not sporty, addition to a garage. The ZZR’s a tough old girl and many run into high miles with no mechanical problems. Regulator/rectifiers can fail, taking the battery with them. Cush drives wear fast – some owners bulk them out with slices of inner tube. The mild steel downpipes are particularly prone to corrosion and tend to fail at the collector box first. The finish on the wheels and brake calipers can suffer if used in winter and not cared for, too. I’ve ridden the ZZR loads of times and to be fair it’s not a bad old bus. Big, comfortable, and surprisingly quick for all their dated looks, with a good dollop of midrange too. The brakes were good in the day and still adequate now. The suspension at either end feels soft compared to any modern sports bike but this is ok because it gives a comfy ride, just don’t go getting excited and attempt to race anyone. It’s a dead stable bike and unlikely to have a fit on you no matter what the road surface. Overall then. A big comfortable, surprisingly quick old middleweight with a bit of a paunch and a huge image problem. Is this a bad thing? Not really. The Bandit range of bikes brought cheap, reliable, and most importantly when it comes to the 1200, BIG power to bikers the world over. And what makes it even more remarkable is that over its 10 year life span, the Bandit 1200 has actually dropped in cost, making it even more of a bargain as every year goes by. At its launch in 1996 a 1200 cost £5,999. When the air-cooled model finally popped its clogs in 2005 it was going for under £5,000, that’s the power of mass production. The more you make the cheaper it can be sold for, and Suzuki has made a lot of Bandits. So what makes it so special? Well obviously price plays a big part in the appeal. The secondhand world is flooded with Bandits of every size, shape and denomination, so picking up a cheap one isn’t a problem. Early models go for less than £1,000 while later ones aren’t much over £3,000 for a beauty. Which is stunning value when you consider what you get. Yes, it may be slightly old technology but often old isn’t a bad thing. Think of it as tried and tested. When you sit on the Bandit 1200 you can’t help but notice what a big bike it is, and perversely how small and narrow the bars are. The seat is gigantic with approximately one mile of padding under your arse while the pegs are set low and the bars at a comfortable reach. But there is something odd about them, they feel too narrow. Fitting a set of wide Renthals is a common modification. But it’s not the bars that sell the bike, it’s the engine. Despite the fact the 1200 air-cooled motor pre-dates the time when the dinosaurs ruled the earth it’s still a beauty. There is no need to go looking for power with the Suzuki, it’s all instantly on tap. As with any air-cooled engine the Bandit isn’t a high revver, but from the moment the rev counter’s needle starts to register activity the power is delivered in one solid, and torque-laden, lump. It’s smooth, vibration free, and very powerful. A lot of riders dismiss the Bandits engine because it doesn’t have water-cooling, fuel injection or even a sixth gear, but they do so at their own cost because it’s a fantastic motor. Which is a good thing because the Bandit’ chassis, especially on secondhand models, isn’t the best and doesn’t like being rushed. Even from new the Bandit’s suspension was soft and soggy. Throw in a few thousand road miles and it’s bouncier than a fat kid on an inflatable castle. You don’t corner as such on a Bandit 1200, you aim it at the apex, throw it in and hang on while the bike pitches and rolls from end to end while its suspension recovers from the shock of actually being asked to do something other than deal with bumps. There are a million and one aftermarket companies set up to deal with this affliction, and a new shock and set of stiffer fork springs makes a huge improvement, but it’s something you have to budget for when you buy. Well, if you plan on getting excited on it anyway, because there is an upside. 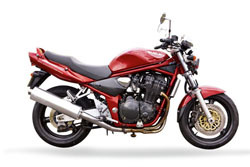 Settle into a gentle rhythm, forget about going Banzai, and the Bandit 1200 makes sense. It’s a great touring bike that doesn’t bat an eyelid when you load it to the gunwales. The soft suspension makes sense as it absorbs bumps in the road and pillions appreciate the padded seat. The key to the Bandit’s success is simple. It offers cheap, reliable transport that does it all. Extremely tough bike that’s cheap to fix if it does have problems. Suspension benefits from a refresh but that’s pretty cheap. Head and swingarm bearings can fail as many got little grease from new. The mild steel collector box can rot and oil cooler unions can corrode to the point the whole unit needs replacing. Although the engine’s developed from the GSX-R1100, the clutch is from the 750 and can fail if abused. A race can and jetting gives power increases. Even when it was launched in the mid 90’s the Bandit was old fashioned. The layout was basic, the suspension unsophisticated and the motor was ten years old even then. Having said all that, for most of the riding you’ll do there’s nothing wrong with ’em, especially for the money. As you don’t push ’em too hard they’re a very easy bike to ride, and even if you do get a bit excited, they won’t bite you, they just start to feel a bit squashy. The motor is a de-tuned version of the GSX-R1100. This oil-cooled lump has so much grunt you hardly need to change gear at all. It’s also one of the most reliable engines ever. You’ll rarely speak to a bandit owner who’s negative about ’em. Alright, stop laughing. Yes, Yamaha came up with the stupidest name ever for a bike with the Thundercat, but don’t write it off just yet. When it comes to secondhand bikes, this cat is still hot property. Amazingly considering the diversity and sheer volume of secondhand 600s on the market Yamaha’s ageing Thundercat is the one that refuses to hang around on dealer’s floors. 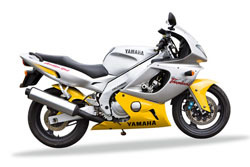 In fact it proved so popular over in the States that even when it was replaced by the R6 in 1999, Yamaha kept making the Cat, selling it alongside the radical race 600 right up until 2005. That’s nearly a decade of unchanged production, which for a supersport bike is unheard of. But is the Thundercat a supersport bike? If you look at race pedigree then yes. The Thundercat has won British and World Supersport races. In the right hands, which have included Shane Byrne and Ruben Xaus in the past, this Yamaha can mix it with the very best. But this isn’t why riders are snapping them up, the real reason is far simpler: this bike offers a tremendous mix of sporting and ‘real world’ ability, something that is missing in so many of the modern 600s. On the road the Thundercat manages to tick every box that the ‘real world’ riders would require. The engine, which is more commonly found in the old-style Fazer 600, has a beautiful mix of mid-range torque and strong top end power, while managing to deliver the whole experience in a package that feels so refined. It doesn’t buzz, vibrate or even have much in the way of power surges, instead it pulls cleanly and with power that doesn’t feel lacking on the road. A Thundercat will produce a solid 93bhp, which is a healthy amount, but alongside this it makes a strong 47ft.lb of torque. And the handling is well suited to road riding as well. Although it doesn’t have any of the inverted forks of current class toppers the Thundercat’s suspension responds very well to the demands of the road. It’s soft without being overly bouncy, plush while still retaining its poise in the corners and solid and secure should you decide to up the pace. Where the ZZR would be dragging its arse and wobbling towards the closest ditch the Thundercat simply gets on with matters, delivering a sporty yet balanced cornering experience. And the brakes are excellent too, as they should be considering the same units were fitted to early R6s. Thankfully the brakes are the only part that these two bikes share, because while the early R6 destroyed wrists with its riding position the Cat is totally the opposite. Despite having clip-on bars the Thundercat’s are set high, giving a sporty yet not extreme riding position, while the pegs also offer a nice compromise between ground clearance and comfort. You can cover miles on the Cat, and many happy owners do. So why aren’t we all rushing out and buying Thundercats? Well, many secondhand buyers are. Because it has had such a long production run a lot of owners tend to start off with an older model, then find themselves getting on so well with it they update to a newer version, which is why fresh bikes hold their value. When it comes to the crunch if your budget is around the £3,000 area the Thundercat is easily the best secondhand 600 on the market if you are planning on using it for more than just commuting. 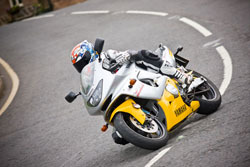 Trackdays, touring or just a fun morning blast are all in its wide remit. Overall an extremely reliable bike. Clutches are a little weak and will give up if abused or at higher miles but they’re not too expensive to replace. We’ve heard the odd mention of gearbox problems which manifest themselves initially as the bike not going into second and ending up needing a full re-build. It’s much, much rarer than the internet would have you believe though. Compared to the modern crop of sports stuff the Cat feels quite big and doesn’t have the top end go that you’d expect either. But there’s a plus side too. The bodywork is wider and the screen is higher so you’re afforded lots more wind and weather protection. The riding position is also more generous and as such more comfy, especially for a taller rider. The pillion position is also very usable. 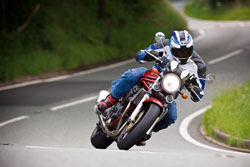 Handling and brakes are good for everyday riding and still adequate when you’re out for a blast with the boys. The ZZR has a stronger motor but the Cat is better in every other respect. The bike that saved Ducati. A classic. The first modern café racer. There has been a lot of accolades thrown at Miguel Galluzi’s design, but one thing is certain, he hit the nail on the head with the Monster. 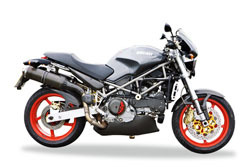 Launched in 1993 this Ducati’s look has changed very little over the proceeding fourteen years. Apart from throwing just about every engine they make into the chassis, the rest of this classic Duke has remained virtually identical. Which has proved both a blessing and a curse. Although few have reason to draw issue with the visual lines of the Monster, the riding position on all models is horrible. Scientists searching for the missing link between homosapians and apes might want to spend a bit of time poking around the Ducati R&D area because this is the only body shape that comfortably fits a Monster. The pegs are set high and back, forcing your body weight forward and onto your wrists, while the bars are low and very wide. This combination not only puts too much strain on your wrists, it also hurts your neck muscles as you continually strain upwards to see where you are going. It’s a common trait between all Monsters, from 600 to 1000, as is the heavy clutch. Unless it is one of the later 600 or 800 Monsters with Ducati’s APTC clutch you had better prepare your wrist for a battering if you own a Monster. So considering these flaws, why did the Monster remain unchanged for so long? One ride tells you all you need to know. Yes the riding position is excruciating, but the sound of the V-twin engine booming out of the almost obligatory carbon Termignoni cans and the fantastic V-twin engine’s character and enormous kicks of torque instantly wins you over. The bike we tested here is the Monster S4, which uses the liquid-cooled 916 engine, and is more than a bit of a handful and only marginally less fearsome than the 996-powered S4R. On the go the engine continually feels like it is straining at the leash, wishing it would just be released to stretch its legs and fly. Although the fuel injection is next to perfect the V-twin motor provides such instant and direct drive the pick-up from a closed throttle is almost too direct, making the S4 hard work at low speeds. Something that isn’t helped by another Monster trait, a total lack of steering lock. Monsters aren’t great city bikes, despite their low seat height, and are far happier on the open road. Ducati has refused to compromise with the Monster’s chassis. The trellis’ geometry is based around the lessons learnt through years racing in WSB and it shows. On smooth roads the Monster handles as well as any Ducati sportsbike. Initially it feels a bit long and reluctant to turn in, but this is just like any Ducati sportsbike, put some effort in, muscle the bike around and the results will come. But it’s a rough ride. On anything less than smooth roads the Monster’s suspension feels harsh, transferring the jolts directly to the rider’s already aching wrists. Monsters are fun, brimming with character and both plentiful and diverse. Life can be tricky with one, but also very rewarding. There’s a huge range of models to cover but, like any Ducati, the key thing is the service history. The 12,000 mile / two year service needs cambelts replaced and valve clearances checked. Skip these or have them done by someone who doesn’t understand Ducatis and you’re asking for expensive trouble. Electrical gremlins are not uncommon – notably reg/rec failure on the 900s and duff under seat connectors on the 600s. Carb’d models can ice in winter. Dry clutches become grabby if abused and slave cylinders can leak. The Monster was designed to be a hooligan. Early two valve per cylinder models just didn’t have the power that a bike with this much attitude needs. With the 916 motor fitted the S4 became a much better proposition. Brakes are excellent and the suspension is firm and responsive. I’ve had one of these round a couple of the UK circuits on track days and it’s only the determined one litre sports bike riders who will be in front of you. The things that let the bike down are the riding position, notchy throttle response, and the fact that they don’t carry the miles as well as the jap stuff. A common theme runs through all of these four bikes, they each have chiselled out a niche in their market and fill it perfectly. The Bandit 1200 doesn’t pretend to be anything other than a superb engine wrapped up in a decent chassis with budget components. It’s cheap, cheerful and not too hard to sort out by spending a few quid. Ducati’s Monster is a bike that you have to learn to love. The air-cooled 600 is a peppy starter bike, the larger capacity air-cooled bikes fun for summer blasts and the water-cooled versions simply bonkers. Most owners seem to take the riding position as ‘character’ and spend their time fitting race cans and carbon clutch covers while nursing aching wrists. Ducati ownership isn’t the gamble it used to be and a Monster is the perfect way to dip your toe into the Italian waters. While the ZZR600 is a popular secondhand bike it is eclipsed by the Thundercat. The Yamaha handles like a proper bike, is as comfortable as the Kawasaki and almost as powerful. Yes, the ZZR is the better tourer or straight-line machine, but for the occasional weekend blast the Thundercat is worth putting up with the marginally less comfortable riding position. Is there a best buy? For us it is the Thundercat or Bandit 1200, depending on where your allegiances lie. Are you a sporty soul or a street fighter? Fashions change at a phenomenal rate. Cast an eye over a woman’s magazine (alongside my piles of bike mags I like to keep abreast of things with Closer and Glamour) and what was hot last month is now just polishing rags under the sink. And don’t think bikes are free from trends. Look at modern sportsbikes. Buy the latest, greatest 600 or 1000cc sportsbike one year and two years later it will be a has-been. Are the Japanese leaping forward with such giant steps year on year in terms of performance? Of course not, but fashion is. But not every bike falls into the fashion trap. Some bikes set their stand up when it comes to looks and adopt a stance of ‘like it or loathe it, this is me.’ Bikes such as the four we have gathered in this secondhand test. Together Kawasaki’s ZZR600, Yamaha’s Thundercat, Ducati’s 900 Monster and Suzuki’s Bandit 1200 have pooled over 20 years of virtually unchanged glory. Which makes them fantastic secondhand buys.